In Europe in the 1700s, there was a great thirst to discover the scientific ‘truth’ about what makes Man different from Animals. Charles Linnaeus published the Systema Naturae in 1735, the categorisation system that we still use today to describe all the species of plants and animals in the world. 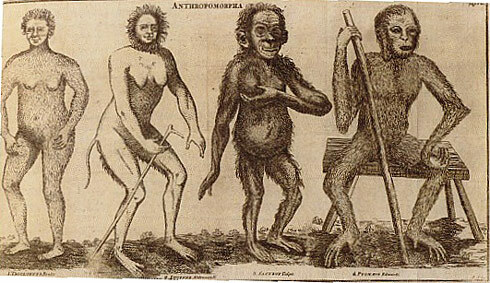 Linnaeus considered that different kinds of people were actually different species: We were all mammals, we were all primates, we were all of the genus Homo (latin for ‘man’). But there were six species of man, and they were not equal – Homo americanus, Homo europaeus, Homo asiaticus, Homo afer (American, European, Asian, African); then Homo monstrosus (monstrous, including giants and dwarves) and Homo ferens – Wild Men. Homo ferens’ characteristics were “mutus, tetrapus and hirsutus” – mute, moving on all-fours, and hairy. We now know that there is only one species of human in existence, Homo sapiens, but Linnaeus’ classifications show how keen the Enlightenment scientists were to try and rationally explain differences between humans. Surely it wasn’t possible that a mute, hairy wild-child was fundamentally the same as the clean, educated, literate child of a European intellectual? Not everyone agreed with Linnaeus that there were different species of human. Others, like Henri Rousseau (1712-1778), believed that all humans in a ‘state of Nature’ were essentially good, but not much more than animals. Civil society and education were required to make ‘Man’. Perhaps you could take a feral child and make a ‘proper’ child out of it? WHAT IS ‘NATURAL MAN’ LIKE? Many scholars believed that feral children might reveal what humans are naturally like, better than any child raised within the usual structures of family, education, community and culture. Wild children were human children who had grown up without the influence of any human interaction – they were living ‘blank slates’. But the wild children who came to the scientists’ and the public’s attention revealed some distressing and frustrating truths about human development. Humans are NATURALLY social. In order to grow up normal, we need other people to care for us, to communicate with us, to keep us safe. Across cultures and through history the way these needs are met has varied, but the fundamental needs remain. A child living in isolation, at the very edge of survival, without interaction, language or love is not a child that is PURE and NATURAL, it is a child that is DAMAGED by an UNNATURAL life. Humans are just not designed to live like that. Where is Kossivi today? Does anybody know him? I can’t find information from the internet.